Since moving to Canada I seem to have been inspired to “do-it-myself”, be it making and preserving jams and sauces (I used my canner for the first time just recently! ), knitting, sewing and making a messenger bag for myself and even attempting to make my own floor length curtains! With all this in my mind I was really pleased to receive the “Artisan Cheese Making at Home” recipe book last Christmas and was even more pleased to have been bought a Soft Cheese Making Workshop in Whistler for my birthday. Heat the milk in a heavy, non-reactive pot until it reaches 85 – 90˚C. Remove from the heat and add the vinegar and salt. Stir gently just to mix. The curds will begin to form immediately. Cover the pot and let sit for 30 minutes to allow the curds to fully develop. Let the cheese drain for 30 minutes to one hour, depending on how dry you want your ricotta cheese to be. 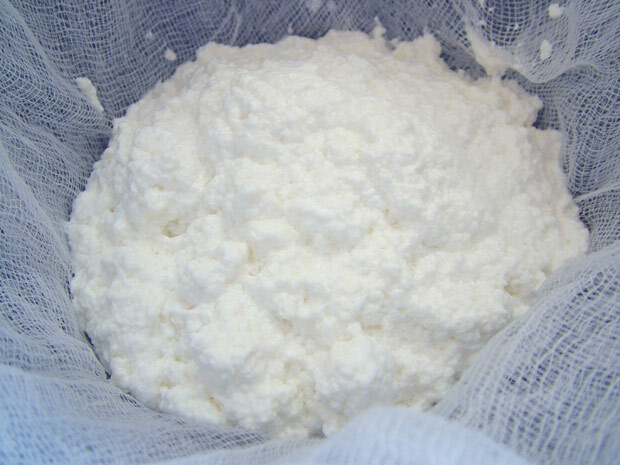 Store the ricotta in an airtight container in the refrigerator for up to 1 week. 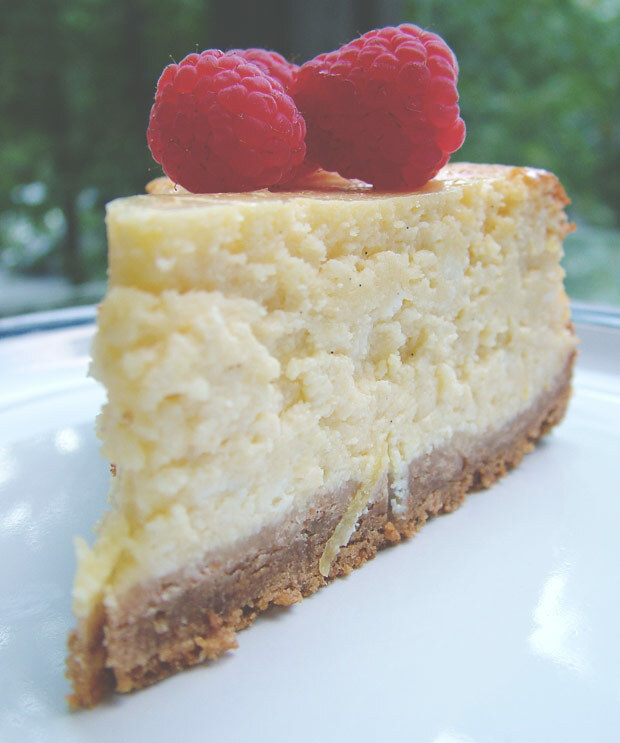 Having made the ricotta I wanted a recipe to showcase it, and what better way than with a Lemon Cheesecake? Fresh ricotta deserves fresh lemon, and who doesn’t like a cheesecake?! Place the digestive biscuits or Grahams crumb mixture in bottom of 9-inch (23 cm) springform pan; set aside. Beat cream cheese and sugar in large bowl with electric mixer until smooth. Beat in flour and vanilla. Beat in eggs just until blended. Blend in ricotta cheese, sour cream, lemon rind and lemon juice. Gently spoon cheesecake batter over wafers. Bake in preheated 325°F (160°C) oven until centre is set but slightly wobbly, 65 to 70 minutes. Remove from oven; turn oven off. Run knife around inside of pan to loosen cheesecake from side. Return to oven. Let rest in oven for 1 hour with door slightly ajar. Remove from oven and let cool on wire rack. Cover and refrigerate for at least 3 hours. When ready to serve, remove from outer ring of pan. Serve slices topped with 1/3 cup fresh fruit. Now I just need to gear myself up to try my hand at some of the other cheeses that I learnt at the cheese making course. Mascarpone, feta, camembert here I come! Inspiration: Own Your Life. Your Life is Your Own.